Wow — A can of paint can really transform a garden! It’s relatively easy to create focal points from your basic garden features: bird bath, fountain, containers and even your garden shed. Color schemes are limited by your imagination. Be sure to check with a paint store for products best suited for outdoor use. Prepare surfaces to be painted to ensure the final coats of color provide a long-lasting look with minimal maintenance. So many colors — how to decide? What about colors to complement the blooms of your perennials. Or use the same color scheme used in the indoor room where the garden is viewed. Perhaps a palette that matches the cushions of your chairs and table umbrella. Or what about the same color in different values? Dare to go bold. 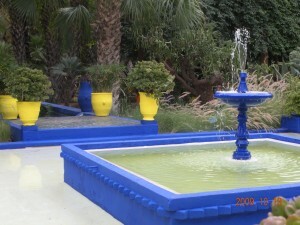 Use yellow, blue and orange to create a look similar to those selected by couturier, Yves Saint Laurent, in his charming private garden in Morocco. As I strolled though, the vivid colors of the paths, buildings, containers and tiled areas were a striking complement to the cacti, ponds and ornamental grasses.